182 pages | 5 B/W Illus. When studying international law there is often a risk of focusing entirely on the content of international rules (i.e. regimes), and ignoring why these regimes exist and to what extent the rules affect state behavior. Similarly, international relations studies can focus so much on theories based on the distribution of power among states that it overlooks the existence and relevance of the rules of international law. Both approaches hold their dangers. The overlooking of international relations risk assuming that states actually follow international law, and discounting the specific rules of international law makes it difficult for readers to understand the impact of the rules in more than a superficial manner. This book unifies international law and international relations by exploring how international law and its institutions may be relevant and influence the course of international relations in international trade, protection of the environment, human rights, international criminal justice and the use of force. As a study on the intersection of power and law, this book will be of great interest and use to scholars and students of international law, international relations, political science, international trade, and conflict resolution. 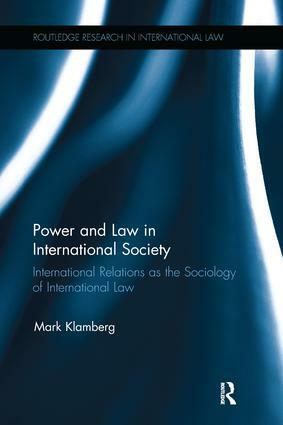 "Power and law in international society makes great strides in developing our understanding of how international law and International Relations scholarship can be utilized simultaneously, and its particular strength lies in its focus on how this can be achieved at the methodological level, which Klamberg demonstrates in clear and accessible terms. In this sense, Power and law in international society provides a model for future scholarship." Mark Klamberg is an Associate Professor in International Law at Uppsala University, Sweden. The series offers a space for new and emerging scholars of international law to publish original arguments, as well as presenting alternative perspectives from more established names in international legal research. Works cover both the theory and practice of international law, presenting innovative analyses of the nature and state of international law itself as well as more specific studies within particular disciplines. The series will explore topics such as the changes to the international legal order, the processes of law-making and law-enforcement, as well as the range of actors in public international law. The books will take a variety of different methodological approaches to the subject including interdisciplinary, critical legal studies, feminist, and Third World approaches, as well as the sociology of international law. Looking at the past, present and future of international law the series reflects the current vitality and diversity of international legal scholarship.